Between the UNESCO protected city Bolgheri and Castagneto Carducci in the Maremma Livornese, we find Tenuta dell' Ornellaia. The wines from this area have been amazing years the wine world the last years and have many wine lover dream. Bolgheri is the cradle of the 'Super Tuscans' of which Ornellaia is without doubt the largest. The domain has about 91ha of vineyards with most well-known grape varieties from Bordeaux – Cabernet Sauvignon, Merlot, Cabernet Franc and Petit Verdot. 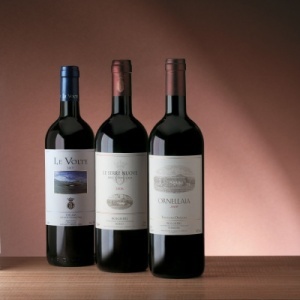 The domain produces only 4 wines: Their flag ship is Ornellaia, a typical Bordeaux-blend (60% Cabernet Sauvignon, 25% Merlot, 12% Cabernt Franc, 3% Petit Verdot). A dark red colour, aromas in which black fruits have been mixed with notes of humus, slightly smoked but very silky taste followed through by a velvet aftertaste in which the tender tannins and wood taste keep each other in perfect balance. This is without doubt a bottle of a rare class. Le Serre Nuove is the 'second wine' of Ornellaia, in the literal term of the word. The wine enjoys one and the same education in oak barrels, as well as a similar short lopping and care in the vineyards. In logical consequence this wine is a comparable blend to its large brother. Le Volte is, thanks to 30% Sangiovese, a wine with a typical Mediterranean character, lightly spicy, aromas of ripe red fruits and mouth filling aftertaste. Only in special vintages there is Masseto, 100% merlot. A wine that can be measured with the largest wines on this planet, complex and opulent. He is often linked to Château Petrus because of the similar grapes variety.